Krill are small crustaceans resembling shrimp that are found primarily in the Arctic and Antarctic oceans. Vital to the planet's marine ecosystem, their diet consists of phytoplankton, copepods, zooplankton and algae. Krill are quite resilient and can go as many as 200 days without eating in environments with limited food sources. 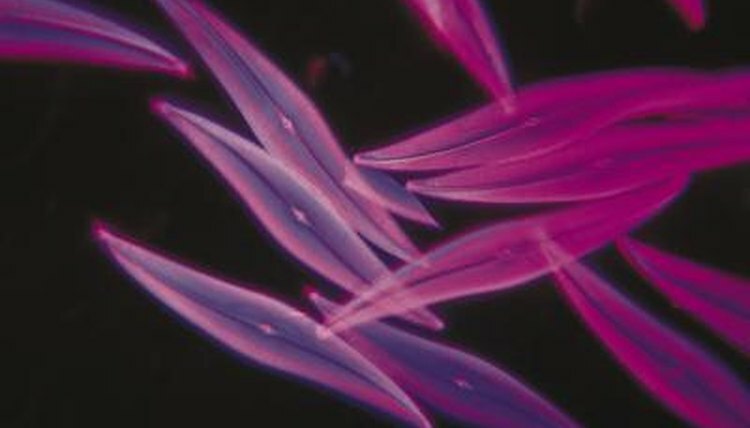 Krill feed on phytoplankton, which are microscopic, single-celled plants found on the ocean’s surface. Phytoplankton have chlorophyll with which to capture sunlight and undergo photosynthesis to convert it to energy. Krill strain phytoplankton from the water using specialized legs attached to their thorax called "perepods." Krill form a net with their perepods through which they scoop up water and trap phytoplankton for consumption. Copepods are oar-footed crustaceans that live in diverse habitats. Some are found in fresh water, while others subsist in hypersaline conditions. More than 240 families of copepods exist. Copepods are very small, with the largest measuring no more than 0.4 inches. Zooplankton is a collective name for a variety of tiny ocean life, which includes crustaceans, snails, jellyfish, single-celled organisms, worms, sea cucumber, mollusks and fish. Zooplankton don’t swim, but rather float along with ocean currents. Krill are mostly herbivorous; however, they do consume zooplankton, which provide krill with protein. In Antarctica, algae can be found growing underneath and inside ice during winter. Snow algae refers to algae that grows in semi-permanent to permanent snow or ice in alpine or polar regions, in temperatures lower than 50 degrees Fahrenheit. Krill can rise to the ocean’s surface and find plenty of algae to consume on a floating piece of ice.